SIS Alumnus Lance Werner (MLIS '04) has been named Library Journal's 2018 Librarian of the Year! Lance Werner is Director of the Kent District Library, an 18-branch library system serving Kent County, Michigan. 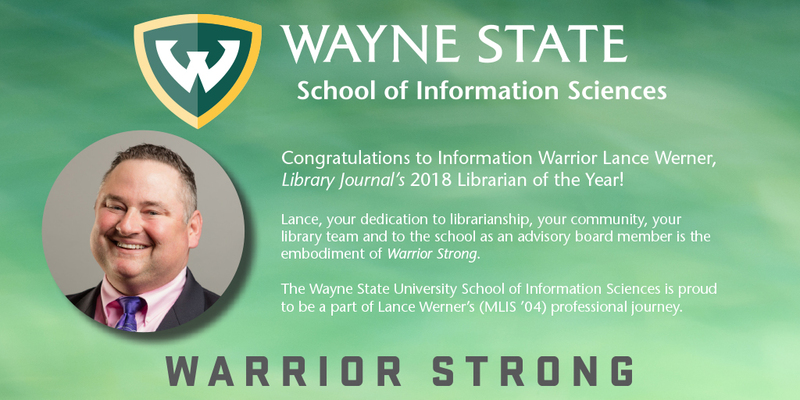 In 2016, Lance was named a Library Journal Mover and Shaker and in 2017, was named as a Wayne State University Distinguished Alumni. He was also named the recipient of the 2017 Urban Libraries Council Joey Rogers Leadership Award and the 2017 Michigan Library Association Librarian of the Year Award. The School of Information Sciences is fortunate to have Lance as an advisory board member. Congratulations Lance, on this well-deserved honor!